It is with much delight that we are introducing our fifth Guest Editor – The Eroles Project. 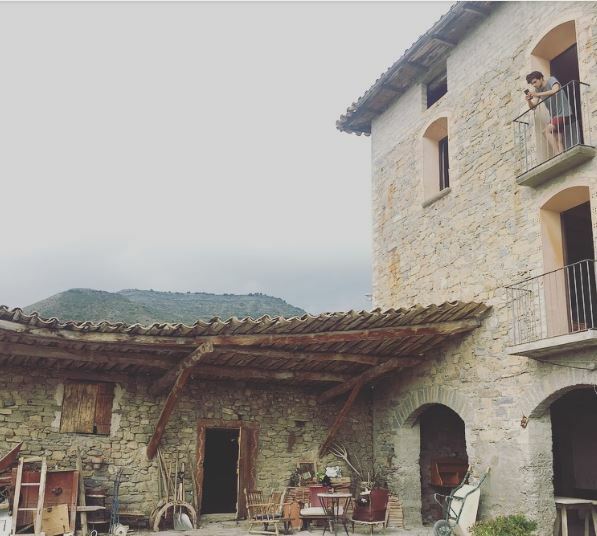 In this introductory piece, Mona Rathsman, one of Eroles’ co-founders, shares her experience of being a part of designing, coordinating and holding the explorative learning-for-action residency that takes place in Catalonia, Spain each summer. In this blog she talks about personal edges, ‘Deepening Citizenship’ and how Eroles is developing a new approach to both learning and taking action in the world. Casita de Colores is a beautiful expansive stone house in Eroles a tiny hamlet in Catalonia. It is where the Eroles Project was born, and it’s been the home of Eroles residencies over the last three summers. Change-makers from around the world have joined the residencies since 2015, exploring themes that feel relevant to our times. We gather together to reflect, exchange, and collaborate in designing projects, building networks and taking action. During this month of writing blogs, as well as making a film and a podcast for Transition Network, we intend to share our experiences, approaches and learnings, hopefully sparking questions and important conversations. In this first blog, I will attempt to share some experiences with you from past residencies; with the hope that you will sense some sort of recognition when reading them, and create your own understanding of what it is that we do and why we do it. What is the Eroles Project? I could give several answers. It is a network of change-makers connected through a set of evolving principles, annual learning-for-action residencies, an online community platform and a library of resources. It is a threshold marked by a cobalt blue door. It is a small core team of organisers, a growing number of alumni and an advisory board. It is projects and workshops that root around the world. Mostly though, in whichever form, I feel it is an opportunity to inquire. 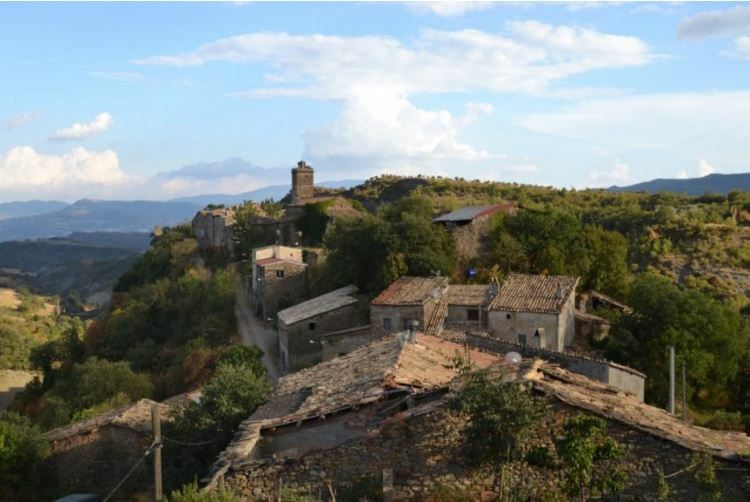 Eroles Project manifests itself primarily through annual gatherings in the village of Eroles, taking the form of co-created residencies. A different theme is chosen every year framing the work we do together here; Climate Justice in 2015, Borders 2016, and this year, Democracy. These are chosen according to what seems to be most alive, for us as organisers and also in the collective consciousness. Current events have been attracting huge amounts of attention around democracy; the rise of Podemos, Brexit, Trump… Yet these big P politics are not the only things going on. If we look at politics with a small p – how we are participating in the public realm individually and together, how we act and respond as citizens to events happening around us, how new networks are growing through the cracks of more rigid political structures – there is a lot of work being done here too. This latter frame is what we have been reflecting on, exploring and practicing in Eroles this summer during two residencies: ‘Deepening Citizenship’ and ‘Emerging Politics’. One of the most significant outcomes of each residency is the ongoing friendships that are made. The conversations that happen at meal times, during breaks, cooking together, hanging out at the lake, in the (one and only) local pizza place, are the ones that seem to truly deepen the relationships within the group. After dinner, sitting in the garden with Jane and Lukas, participants from Deepening Citizenship, looking at the UNESCO-protected sky (yes it’s one of the clearest skies in Europe), and we’re all giggling out of fatigue, I know I am sitting with friends. Creating these bonds across movements is what has ended up being one of the clearest keys to fostering action and sustaining engagement - understanding fully that one is not alone, through spending time with each other in different ways. These relationships, or radical friendships (as we refer to them), are the foundations upon which we have been able to create projects and take action after each residency, and put our learnings into concrete practice. As a result of the first residency in 2015 for example, the Eroles community collaborated with a Parisian squatter crew, creative climate activists from India, Bolivia and South Africa, and other European collectives, to build and host a convergence hub in Paris during COP21. In November and December 2015 over 100 people from a huge diversity of places and backgrounds lived in this space in Paris; exchanging stories of resistance, co-creating actions and living a possible future in the midst of disempowering climate negotiations. It was an amazing experience of self organisation. The Eroles community hosted an opening party for internationals and locals engaging with climate activism and ran public events on reimagining activism. 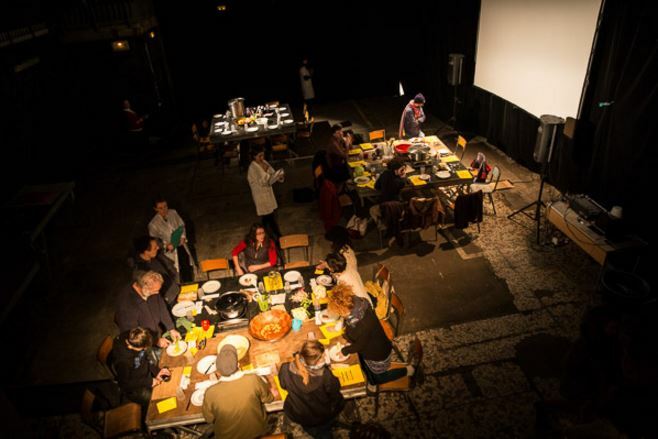 We also hosted The UN Canteen, a performance game which invited audiences to ‘bring a vegetable to the theatre’, sit at a table of eight strangers and collaborate to cook dinner together. 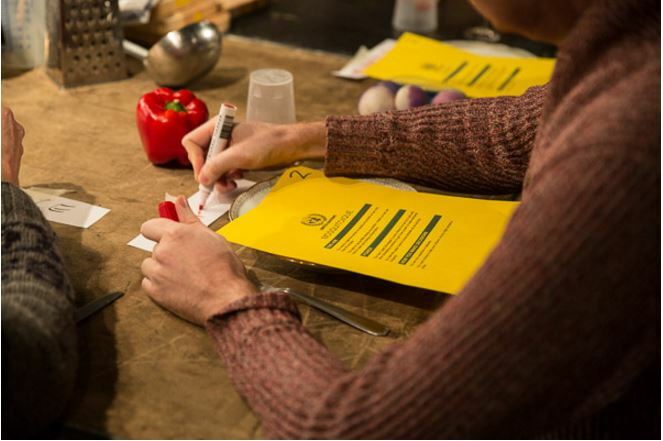 On entering, depending on the weight of their vegetable, audience members were assigned a power card relating to a UN delegate and the qualities and powers of the country they represented. It was a simulation of the complexity of power, resources and relationship to climate change between countries in the official conference in Le Bourget. Audience members had varying resources, food and time for cooking, some had access to the spice corner, some became lobbyists and tried to convince the delegates to add salami to their a vegetarian meal. Taking place over dinner time – with 40 plus hungry audience members – people got really into the game. One of the surprising things while debriefing was how many people reported feelings of compassion (many for the first time) towards those inside Le Bourget trying to reach consensus on viable and realistic climate agreements. Our 2016 “A Camp as if People Matter” residency had the explicit focus of seeding a project with refugees and migrants which responded to migration in a positive way. After an intense three weeks together, along with some serendipity, the Regeneration Project: Granada, is now well underway to regenerate lives and land in the Alpujarras, Granada. The team who met during the residency have spent the year mapping the area and meeting with stakeholders to understand the context and what’s needed. 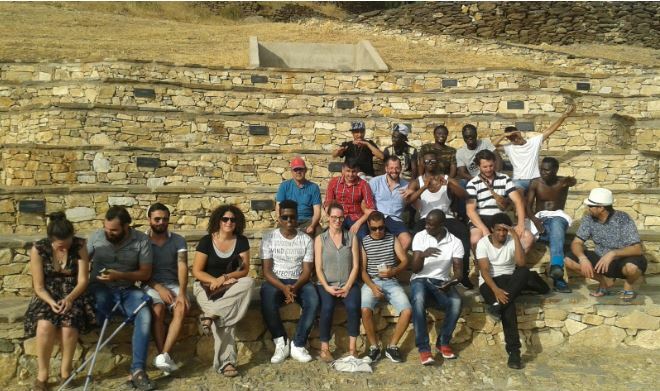 They have set up an association with refugees and migrants who are now running permaculture, agroecology and social inclusion trainings in Granada, and over the next few years will be setting up ecological enterprises, cooperatives and sustainable livelihoods. The ultimate aim of this project is to contribute to re-populating a network of semi-abandoned villages with a new co-created governance, weaving traditional ways of doing things with a celebration of a plurality of cultures. 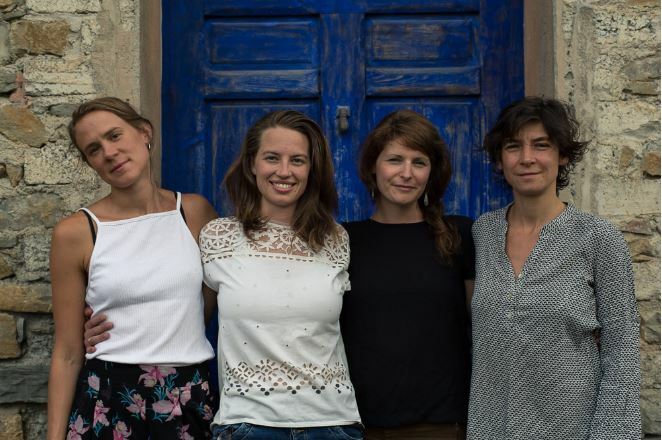 Ruth Cross and Maria Llanos from the Eroles project have gained many insights and examples of ‘Emerging Politics’ from this summer’s residency to take back to the team in Granada. As each year goes by, it becomes clearer that every big theme we explore, be it Climate Justice or Democracy, is a different manifestation of the same root problems. In a complex system, issues such as power, privilege and the delusion of separation, reveal themselves in the social, political and ecological spheres. Although the participants each year hold slightly different questions—What is creative action? How are borders inhibiting us to meet each other as human to human? What does being an engaged citizen mean to me? The inquiry is still the same – at Eroles, we are trying to see what is blocking us from participation here, in these very residencies, by looking at how power and privilege is playing out in the group. From there we move out to how we each deal with power in the wider world, in order to notice our patterns in what we consent to by being passive or by the way we act. Only when we can meet these things in ourselves can we see how they play out more clearly in other contexts. 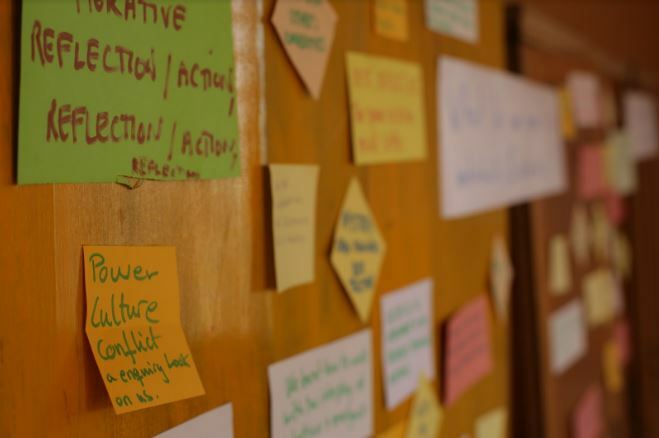 With this learning we can practice how and when to step up, take a lead and take action in ways that consider the whole of the system; be that the Eroles residency group, a Transition Network project or an emerging political party. Although it is important to create smooth processes in groups, we believe even deeper learning lies in understanding how to act in periods of discomfort, confusion or uncertainty. Reality is not always safe or comfortable. My experience is that social change gatherings, retreats and transformative education spaces often try to manage expectation by creating safe containers, having equal talking time, sustaining engagement through well developed group dynamics and minutely facilitated workshops. We believe that these well honed tools carry the great risk of actually dampening emergence and preventing people to “think” together. Inspired by our teacher Patricia Shaw, and the work of Hannah Arendt, this is how I’ve come to understand what it means to “think” together. It is not merely about co-creation or collaboration, it is not about people coming together and sharing what they each think they already know, but rather learning through the actual being together in our plurality of experiences, and carefully discerning our judgements and actions, to then reveal our careless patterns of thought and become more aware of how we are actually participating. This work requires attentiveness, to our full experience of what is actually happening. Of course, this work can be uncomfortable (as Madelanne Rust D’Eye recently shared about in The Roots of White Supremacy are in our Bodies), as we venture out of the safe container and really dare to challenge ourselves. I recall a moment during A Camp as if People Matter, the third residency in 2016 on the topic of Borders. We were a group of people from various parts of the world, including Africa, the Middle East and Europe. We were doing an activity around prejudices, role-playing as defenders of racist statements in the media concerning the refugee crisis. It was very uncomfortable, but as we tried to laugh away the situation, mocking the absurdity of the statements, I knew inside me that the discomfort I was feeling came from the fact that a part of me believed the statement I had pretended to defend. And I shared this in the group. The silence was deafening, until another participant also shared that he thought several people in the group actually believed their racist statements. Beyond the border of political correctness, there was a palpable sense of tightening. My feelings of shame, guilt, confusion and fear arose as, out loud to the group, I revealed some of my hidden beliefs. And yet, the way the group came back together, acknowledging that we all hold prejudices within us, felt like we had taken a step further and deeper in understanding what it means to meet each other as humans. Over a much needed cigarette afterwards together with two other participants, the bonds had become noticeably stronger. We do not want to lull ourselves into a comfortable consensus that “we are the good people”. Where would this lead us? To a huge political divide, each side equally dogmatic and blaming the other. This constant “othering” replicates the systems we are trying to shift, in that we are still acting with the delusion that we have the solution. As sculptor and activist Jens Galschiot said in a Skype to Eroles just a few days ago, “the idea that you need to have a solution is a trap.” I am reminded of my agency, by which I mean to say that my choice not to consent, is a valid enough place to start acting from, going forward, wherever that may take me, without the need to come to some neat conclusion. The nature of the public realm can be precisely that. A space that does not aim for people to agree with each other and reach conclusions, but to investigate, acknowledge, and appreciate the differences of our experiences, creating a space that more closely reflects the realities and pluralities of life and allows for something truly new to emerge. I want to live in a place where we are free to be me and also us. The Eroles Project started as, and indeed still is, a collaborative experiment. We test different ways of gathering and organising in order to discern when change happens. How much structure is needed to foster collaboration? How does one remain fluid and thus adaptive to unpredictable changes? How professional or personal should we be, as organisers? As each residency finishes we gather our thoughts and reflect together on what happened – a process we are in as I’m writing this. One thing that’s clear from the past two years and this year’s residencies—Deepening Citizenship and Emerging Politics— is the importance of friendship; not just with those who we instantly identify with – but with those we initially consider (even if in our hidden beliefs) as other. This has had a huge affect on me and is why I love doing what I do together with the team of Eroles Project. It is what can catalyze action in me, during periods of passivity. If you were to reflect on how you are participating in your family, friendship circles, community or even nation, what blocks might there be? What could catalyse action in you? Create spaces to hear everyone’s voice within your team, family, project by starting the day or meetings with a ‘check-in’ to hear for a minute or two, one-by-one, how people are feeling. Invite someone you don’t know who lives on your street to go for a walk. See what comes up in your conversation. Share the things that concern and inspire you both about your area. On your own, with family or colleagues; go on a sensing journey in the public spaces in your city, town or neighbourhood. What do you see, feel, hear, smell, notice is happening? How are people inhabiting, moving through and using the public space? During your next family, work or community meeting focus on the question: how and why I am participating and what motivates me to participate. After the meeting take a few minutes to write down what you noticed about your participation. Encourage others to do the same and take time to listen to each others notes. Spend time together caring for collective project, work or community spaces for example sharing cooking, washing-up, cleaning and making the space beautiful. The last time you did something for the first time. When you disrupted the status quo. Moments of perseverance or courage. I am loving reading about the Eroles Project – you’re doing such interesting and brave soul work! Hope to join you some day for radical friendship and thinking together. Thank you for sharing.